A couple weeks ago, Marissa Mayer surprised a lot of people in the industry when the company she runs now, Yahoo, announced plans to outsource some of its ad sales to the company that made her famous and she quit in July, Google. The news was surprising for a couple reasons. When Mayer quit Google in July for the job at Yahoo, she didn’t do it in the friendliest way. A source tells us she gave Google only 30 minutes notice. 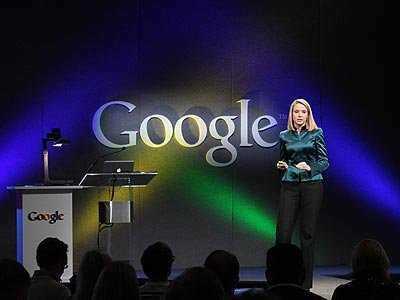 Then, a couple months later, she poached another Google executive, Henrique De Castro, and made him her number two. Shortly after Mayer arrived at Yahoo, she squashed a similar deal that her predecessor, interim Yahoo CEO Ross Levinsohn, had in the works. So, what gives? Why did Mayer do the deal now? What does it mean? We asked several people in the industry – all of whom happen to be ex-Yahoos, some of whom work at companies that do business with Yahoo. That deal has been in the works forever. [Former interim CEO] Ross [Levinsohn] and [former Yahoo corporate development executive Jim] Heckman were pushing for that big time. Bid density. The hope is that this deal creates a really stable price floor raising rates across the board. Because [Yahoo’s display advertising exchange, Right Media] has been under-invested in on many levels, the amount of demand is significantly less than the amount of supply, so economical principals dictate that as such, prices will fall. This deal may impact pricing and yield management that impacts all campaigns all the way through the sales org by creating a new equilibrium point. If you look at Yahoos financials, their display ad business which is the main one they control (not search) is continuing to decline. Sales leadership is weak and good sales execs continue to leave. This deal signals the fact that they do NOT have a good handle on how to run their own business. Make no mistake, it’s a bandaid. It doesn’t address their fundamental issues it just masks the symptoms for a while. Insiders seem to be split on what the deal really means. But one thing is clear: Yahoo’s deal with Microsoft is likely forcing it to accept lower revenue per search than a comparable deal with Google would. So Mayer would be crazy if she weren’t trying to either shift to Google or use Google as leverage to extract a better deal from Microsoft.